Creatively Beautiful offers full list of services for your wedding day needs. We also offer a variety of headpieces, veils, and jewelry and take-home makeup kits at an extra cost. For a list of accessories and other items for sale or rent, please contact us. Please Note: Due to high volume of weddings, an appointment must be made with a bridal consultant to go over any important information. 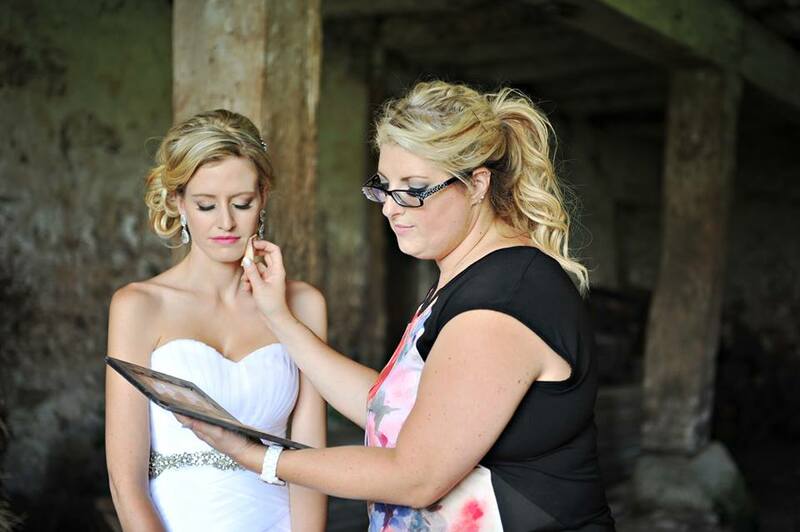 Our professional stylists and makeup artists stand behind many award-wining looks and years of professional experience. If you require more information, we can help. Please contact us to enquire about rates or for any additional information! In the interest of all, we request that clients provide us with 24 hours notice of cancellation, and 48 hours for group bookings. Should you not cancel with these guidelines a 50% cancellation fee will apply. All deposits are non-refundable and go towards booking your appointments for your prospective date. Clients with Gift Certificates: You must notify the salon within 48 hours of cancelation of your appointment or your gift certificate will be nul & void. 1. Please arrive with clean, dry hair to help the hold on your hairstyle. An additional fee will apply if you request a wash and blow dry or straightening. 2. Bookings and changes must be made by the bride with C.B. Buzzanga or personal bridal consultant. 3. Make sure your face is cleansed and moisturized prior to arrival at our salon to ensure that makeup holds all day long. We also offer facials to ensure a glowing complexion (At selected salons only). 4. During your trial run, please wear pants and an ivory or white shirt that is as close as possible to the colour of your wedding dress to ensure that makeup will be correctly matched. 5. Bring in pictures of makeup and different hairstyles that you are interested in for the makeup artist and hairstylist to consider. 6. Please bring in your headpiece, veil, and any hair accessories you have for the trial run. We also have these and other accessories to try on and purchase during your trial run, for a complimentary look on your wedding day. 7. Try to have your whole wedding party, including your mother, mother-in-law-to-be, and bridesmaids present if possible following your consultation. They will receive a free verbal consultation. We will assist them by way of determining hair styles and makeup looks customized for each individual. Please email us for details. 8. On the day of your wedding, you are invited to bring in any drinks or food that you feel will make your day more special. We do offer complimentary beverages in our salon, but you may feel free to bring a more personalized selection. 9. For your wedding day we can operate before our normal business hours for your convenience. A fee of $10 per person may apply prior to 7 a.m.
10. Most importantly, everyone must be on time to your wedding day appointment. Even starting 15 minutes late will put everyone behind. Please do not be late for your special day!